The feature set of RackForms is simply unrivaled. No other form building package delivers so many features for such a low price, and no other package makes using these features so easy. RackForms supports saving directly to your Google Apps domain account. This means you can write to your spreadsheet or text document strait from a RackForms form submission. RackForms takes care of all the dirty work like creating new files and adding spreadsheet rows, which lets us concentrate on the important bits like managing data and user access. 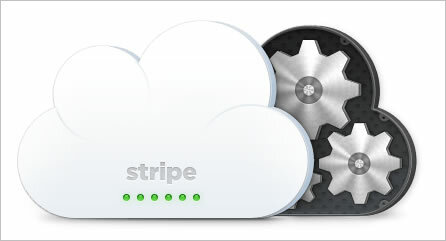 Stripe is a fantastic payment service with the mission of making accepting web payment as easy as possible. RackForms fully incorporates this service by creating a beautiful invoice of our items at checkout time. Of course just like all other RackForms features we have a wealth of configuration options. You can even create forms that support single items and subscriptions on the same checkout page. 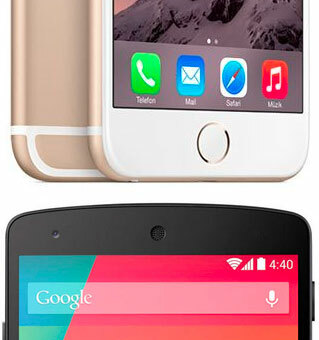 As portable devices become more popular we want to make sure your forms keep pace. As great as the latest tablets are, filling in web forms could still be much easier -- enter sliders. With sliders instead of having to bring up the keyboard for numeric fields, users simply touch and drag the slider to the desired amount. Of course these sliders work on desktop devices as well. Better still, like all elements RackForms automates everything for us, but if and when we want, provides 15 control points to make sure every aspect of the slider meets our exact needs. Digital signatures are riding a huge wave of popularity right now and for good reason: they allow us to automate processes which would ordinarily require 'paper-intervention'. Going digital is environmentally friendly and saves loads of time in the process. Better still, as you would expect RackForms is all about customization and power: at the most basic level no work is needed. But if we want, we can save digital signatures to a pre-made database or to a table of our choosing. 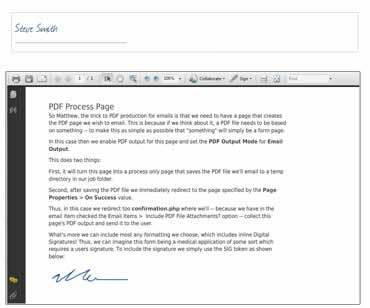 We can also include signatures in a PDF page, as inline images in an Email, or even as Email attachments. We have several styling options, from pen and background color and width, and can also set our signatures mode, choosing between type only, draw only, a mix of both, or display only. This flexibility ensures our signature data is right where we need it. RackForms isn't just for email forms and applications; it features a wealth of options for survey creation and management. In fact, RackForms features two modes for survey creation: native and custom. In native mode RackForms ships with the powerful Survey Module. This tool lets us quickly define our survey by simply pasting raw text into question and answer text blocks. In custom mode we can turn any radio or checkbox into a survey object. This makes it incredibly simple to turn any form into a survey with a simple click of a button. When it comes to collecting data RackForms ships with the Survey Viewer for quick and easy data viewing, as well as raw data export. In RackForms every time we save a form we also create a mobile version. Having this automatic creation of mobile forms means we can design to our hearts content for the traditional desktop and still have the option of using the pre-built version to save loads of time. As you would expect we can always just go ahead and create a specific mobile version if we choose, though the option of having an automatic default is a huge time-saver. RackForms fully supports 3 PDF export methods so you can always deliver your forms in the manner that best suits your needs. RackForms even supports creating web forms from PDF documents! With RackForms AJAX isn't just a buzz word, it's a fully implemented set of features and code practices to help make your forms more interactive, user friendly, and of course, powerful. At the highest level is the AJAX Module which takes all of the guess work and coding out of creating powerful AJAX connections between form fields. Chain these calls together for even more control. 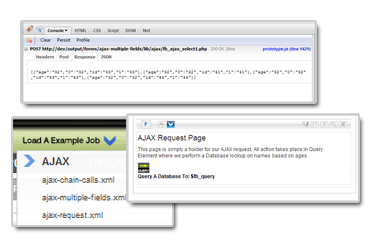 See the AJAX feature in action on our video features page! Using an ultra-simple point-and-click paradigm, we can build calculations by selecting form fields and operators to create the logic we need. Our logic can be as simple or complex as we need. Of course this system works across all form field types, from text and text areas to checkbox and radio items. We can easily apply filters to our final results, from currency formatting to floor, ceil, and rounding functions. The Calculation Module gives us the power we need without the complexities involved in normal calculation logic for our web forms! Sure RackForms is a fantastic tool for creating web forms that collect information from users, but we can also create forms that allow users to modify existing data as well. 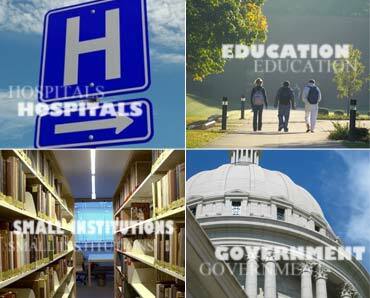 You've seen these forms many times before: from Amazon to Cars.com and others, these forms display a list of fields from a database, such as auction listings, personals, and so on. This highly sought-after feature is included with every copy of RackForms, saving hours of coding and tedium. Protect your PHP web form entries and give users confidence with built in, customizable CAPTCHA security support. Change the most important aspects of your captcha block, or disable it altogether. RackForms supports the popular reCAPTCHA and noCAPTCHA anti-span standard, a high-tech 3D-Captcha system, and the ultra secure and user-defined Challenge Question method. No matter what security type you choose, RackForms always creates web forms that are safe and secure. With RackForms we needn't worry about random users accessing our sensitive forms and data. With the flick of a switch RackForms locks down our forms using a few simple fields for easy customization. Set an optional user name, password, login attempts, and the messages users see during the login process. It's just another complex task RackForms performs for us, letting us concentrate instead on what really matters--creating effective forms and applications. One of the keys to creating great PHP forms is the ability to quickly and accurately dive into the source code of your forms and make changes at will. RackForms has always been the world leader at providing instant code access, but the exclusive Advanced Code Editor takes this concept to a whole new level. Automatically indent and align code, all in a beautiful, fully syntax highlighted display. A customizable tooltip system lets you tell users exactly what they need to know to get the form filled out right the very first time. Set options ranging from custom effects, activation triggers, position, hide delay, color, and more with ease. Most importantly, RackForms tooltips support full HTML content which means you can include exactly the type of help you need without resorting to overly complex text-only instructions. 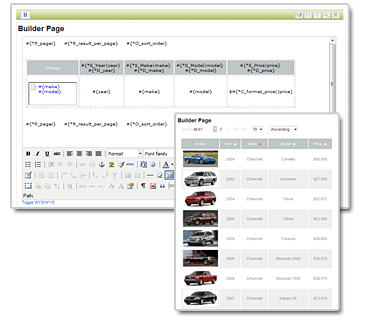 More than just a form builder, RackForms was built from the ground up to be a multi-user/multi-site application. We support unlimited users at four access levels. This makes deploying RackForms web form management across your network safe and secure, as you limit who has access to what. RackForms is about more than just building web forms, it's about managing them and all your users too. Send form submissions to the Entry Viewer and have your users data automatically managed and displayed. Sort and delete entries with ease, or export out to Microsoft Excel (tab delimited). For web form entries that contain files or images, RackForms offers one click access--click on an image to view, or click on a file icon to download that file. You can also edit text based entries on the fly with the easy edit mode! Manage the look of your forms with powerful style editing tools. 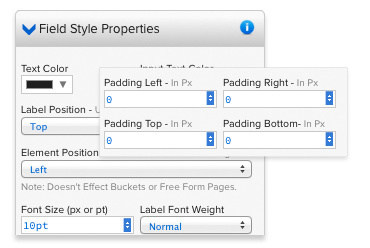 Independently adjust text color, font-family, label position, and font-size for all field elements. You can also apply background images and repeat axis, or set background color or image for the form and page elements. We can also center forms on the page with a single click of the mouse and add background colors and CSS 3 rounded-corners and drop-shadows for pixel-perfect full-page forms. Combined with the RackForms real time preview, your final form will always be exactly what you want, all without having to code a single line! RackForms lets you tie Drop-Down menu's to dynamic SQL queries, freeing time and making your forms more dynamic. Better yet, all Database connectivity via RackForms is handled through optional Stored Procedures or mandatory Parameratized queries. Your security is always a top concern, and the forms RackForms creates always deliver piece of mind. Learn More. Why limit your creative potential? RackForms is a native multi-page form tool, which means branching logic, conditional code, and much more is always available and built in at the lowest levels. Instead of forcing your users to fill out lengthy web forms break them up into manageable chunks for better response rates and less end-user fatigue. Even better, RackForms supports save and resume later, so users can leave and come back without having to start over! Sometimes we'll find ourselves in the position of having to provide users a way of adding an unknown number of similar entries. For example, we may have a Football team signup form where each member of the team gets their own record in a database. In RackForms we can easily create such forms by using Bucket Repeaters. A Bucket Repeater simply says that all elements in that Bucket (which is itself a wrapper for a collection of objects), can be duplicated in full at runtime by the user. Bucket Repeaters allow us to create complex and highly customized forms with minimum effort. Sure RackForms is powerful but that doesn't mean it needs to be difficult to use. We believe software should be beautiful and above all else, empower us to do great things. A well designed interface helps us build better forms and applications, allowing us to access the features and functionality we need as quickly as possible. And so from plentiful tool tips to small touches like click and drag within text boxes to set common numeric values, the RackForms interface is a case-study on web-application design done right. With HTML 5 drag and drop operations become first class citizens, which means fantastic drag and drop uploads. Enabling this feature is done with a single check box for our file upload element. We also fully support HTML 5 input types, which means we can turn a simple textbook into a calendar or number selector with a single click. Because RackForms stores passwords in encrypted format, supports ultra-secure Stored Procedures, 4 types of Captcha protection, and is constantly updated and patched with the latest security enhancements, RackForms is a perfect match for mid-to-large size organizations. RackForms also makes ownership easy with easy-to-understand and liberal license terms. For example, the RackForms license encourages us a site license to create forms for multiple domains. Thus, instead of needing multiple licenses we can use one across all sites we own. So if you’re in Government, Health Care, Education, or any other organization that needs to create powerful web forms quickly and easily, RackForms is the tool you need! Since our last major release RackForms has gained over 50 new features (many of them very powerful like Digital Signatures and Bucket Repeaters), and many more are on the way -- of course these major updates are always free! Mix in the fact that RackForms is by far the most feature complete web form builder on the planet already and no one comes close to matching our value. This constant stream of new features is at the core of the RackForms mission statement: provide insane amounts of value for your investment and never stop innovating. RackForms completely eliminates the tedious process of php web form creation. From supporting complex graphical layouts, tight SQL integration, custom result delivery, all manner of email forms, and so much more, RackForms saves you time and money by putting incredible power at your fingertips. Even better, you can own RackForms outright, or subscribe as a service and let us handle all hosting duties. Learn about the advantages of RackForms and check out even more advanced features, or check out the complete feature list. Questions? We love to talk shop! Ready to take the next step? Visit the RackForms Store to pick up your copy of RackForms!